What to wear with pumps with a bow? I have this really cute pair of red Louboutin heels with a bow behind it. I need outfit ideas that would match with it. I personally love flirty clothes and accessories like this. They look great worn with clothes in the same style as well as with clothes in a contrasting style. Here is how you could wear them. One of my favorite looks for girly shoes is to wear them with boyish jeans. It creates a fresh contrast. Here I completed with some funky tops like a Batman t-shirt and a satin bomber. 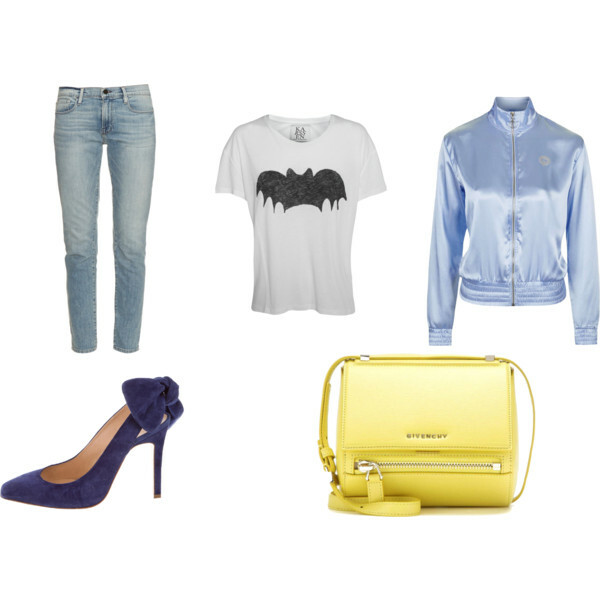 To add a flash of color I chose a lemon yellow clutch which makes the blues in the outfit pop. If the shoes were red, you could wear a pink satin bomber and a blue bag for instance. So here I chose a flirty LBD (little black dress) with some geometry and flounce and paired it with bold red lips, an heart shaped red bag and dedicate innocent jewels. If the shoes are red, replace the red bag with another color (gold for instance). This very parisian look combine low-key classic basics and sophisticated feminine items. The shoes, necklace and sweater say, funny trendy girl. In the meantime, the skirt, trench and color mix mean that you know your classics codes. Here I paired the super feminine sandals with strict tailored high waisted 7/8 pants and a see-through innocent looking plumetis top (to pair with a triangle opaque black bra). You know I have a thing for all black outfits. This one features different fabrics and some gold which makes it work. You could complete the look with bold red or burgundy lips. Works with red shoes too! Ready to rock your Loubs?